I’ve still got three questions to answer from CWPost. I’ll get to them. I promise. But a birthday today got in the way, as did a grant proposal that I have to write for my day job in order to stay employed and keep my staff employed. So it’s important. And it takes up all my time for a few days – driving my anxiety up and me near into madness. Well… you get the picture. 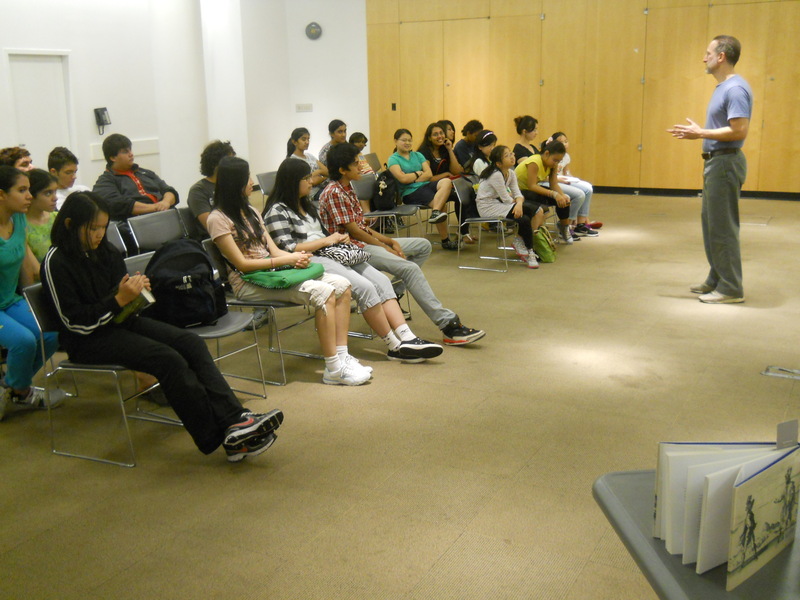 So last week I did a fencing workshop/reading/Q&A at the Flushing Library with my friend actor/stage combatant/fencer Dave Brown. Dave’s the best because he does these things for me for no other reason than I ask him (and I take him out ot dinner). He is an extraordinary friend. We get to fence in front of an audience – and he’s the best fencing partner – totally trustworthy and only once in our time as fencing partners has he every hit me by mistake. Hah. At the reading there were three kids who had read my book and who actually helped me give the synopsis of Open Wounds. That was the first time I’ve had people in the audience who’d read the book. Morya Haughton, the most excellent YA Librarian who invited me and rounded up the kids for the event, told me the library had six copies of my book and it was in constant rotation… and rarely on the shelves. That pretty much made my day. So there were twenty some odd kids at the event and I didn’t know any of them and that was cool. They liked the swordplay – who wouldn’t and most of them stayed an extra 45 minutes after the event was over to handle the swords and ask questions about writing and fencing. Dave and I had a blast. One young woman asked a question that really got to me. She was one of the people who had read the book. “Why is someone like Maddie (Cid’s grandmother) who believes in God, so cruel to Cid?” I had to stop a moment just to let that one sink in. My answer was pretty simple. “Because she is. Just because someone believes in God doesn’t mean they can’t also be cruel. It just works that way sometimes. It’s not pleasant but it’s true.” She nodded and looked away. It made me wonder what the question behind the question for her was. I think human beings are complex and rarely all good or evil – usually a mixture of both to different degrees. Mad Maddie Wymann is like that. You know little of her past but it must have been bitter to turn her into the person she is. And when her son, Cid’s father, disappears, she grieves for him. When she is lost, Cid grieves for her because she is all he has. I’m doing a lecture/reading/Q&A at the Queens Historical Society this Thursday. Let’s see what questions I get there. This entry was posted on October 3, 2011 by Joe Lunievicz. It was filed under Blog, Events, Fencing, Open Wounds, Reading, Stage Combat .